When your body of work spans nineteen albums released over a 46-year period, it’s obvious that your love affair with music is a lifelong one. 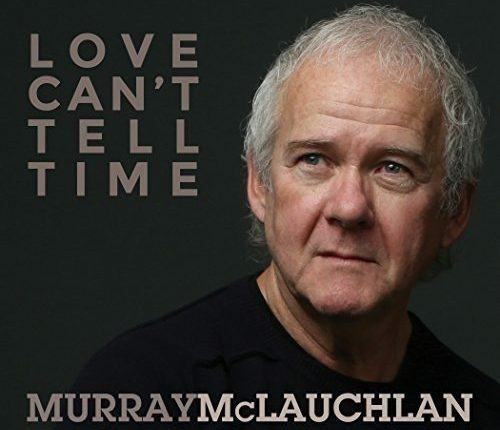 Such is really the only way it could be possible to take Love Can’t Tell Time, Murray McLauchlan’s newest release – by the singer’s own admission, the album is, “A great collection of songs I love to play when I have no other agenda than just to enjoy playing music.” For that reason, it should come as no surprise that there isn’t really a theme which dominates the album other than just an obvious love of playing; at times wistful and others just warm and contented, each song simply makes the most of the “live off the floor” manner in which it was recorded [strings appear on …Can’t Tell Time, but they were added in post-production –ed] and finds some intimacy in the intersection between the music and the album’s methodology. As soon as “Pick Yourself Up” opens the album with an acoustic guitar, gently played bass and McLauchlan’s own folksy vocal delivery, it’s hard not to just trip and fall into the album headfirst. Here, the vintage folk strains ride smoothly beneath a very warm and romantic melody, and the combination is able to easily melt any listener’s heart as the singer picks out lines like, “Nothing’s impossible, I have found/ When my chin is on the ground” and “I work like a soul on fire/ ‘Til the battle of the day is done” and just owns them in his own inimitable way, and more than a few listeners will likely find themselves keeping time for the song as they gently tap it out on their thigh. It’s infectious – but understatedly so. Love Can’t Tell Time is out now. Buy it here on Amazon.